The original abstract of property now owned by Arnold Hafer has a reference of River School having property for a school lot in 1835 and again in 1865. However, there is no direct evidence of a school being built in 1835. 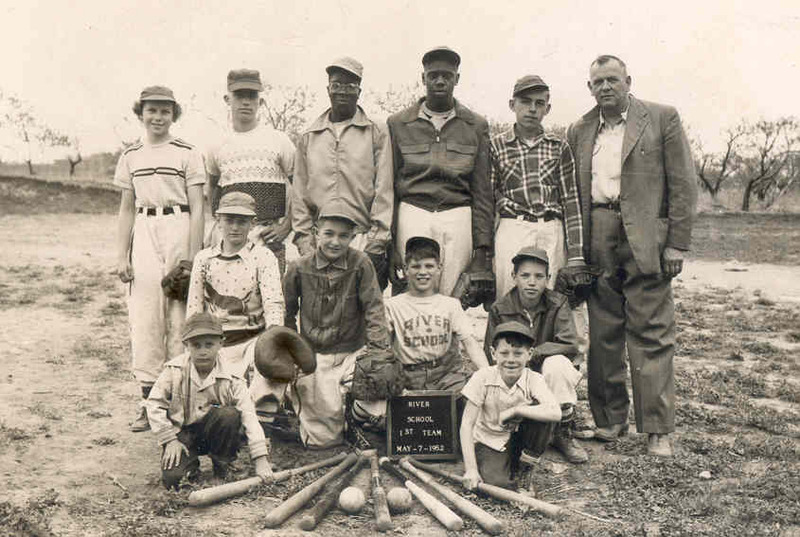 When Pipestone Township was formed in 1843 four school districts were created. Two of those remained when Sodus Township was formed in 1859 but no record remains of which two. It’s known that a one-room school existed in 1862, probably of brick and standing only about 10 to 15 feet back from the road. Fred Gleason was the first teacher of record in 1892. School records show Mr. Gleason enrolled 56 children in school in 1894, although the average attendance was 26 students. His salary in 1903 was $320 for the year. Some supplies purchased in 1903 included: soap 15¢, gold dust 20¢, mop and pail 25¢, stove blacking 10¢. Fall school cleaning that year cost $2 and school insurance was $2.50. On May 2, 1906, a special meeting was held to vote on building an addition to the school. That motion and a motion to issue a $1,200 bond to be paid in three installments both passed; however, there is no record of the addition being built at that time. The July 20, 1908 meeting showed a motion passed to re-shingle, paint, and build a ten-foot wide porch the full width of the school. Records show materials and labor were purchased for work. A two-mill tax was voted in for general purpose. The Director’s salary was raised to $10, the Treasurer’s to $5, and the Moderator’s to $3. Other expenses included 50¢ for four hours labor to repair the drain across the school lot and 80¢ for lawn mowing. The teacher’s records for that year (and the next also) indicate the school enrolled two non-English speaking students. In 1909 the school purchased an organ for $36. An issue that year was whether to hire a male or female teacher for the next school year. Evidently, the board resolved the issue by hiring two teachers: a male and a female. An eight months school calendar was also approved. During these early years J.W. Ludy was hired to do janitor work and was paid $50 to $60 every two or three months. 1910 and 1911 brought big changes. At the May 12, 1910 meeting building a new 24’ x 36’ two-room school was approved, to be funded by selling bonds totaling $3,500 for ten years. At the June 10, 1910 meeting, the original vote was rescinded and an addition not to exceed $2,000 in cost was approved. 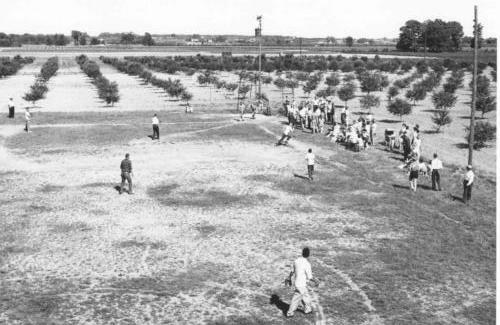 Additional land was also purchased from J. P. Versaw, costing $25 for two rods wide running the length of the school lot. A four-foot high fence was then built around three sides of the property. In 1911, a 20-foot x 24-foot room, built of brick by Mr. Edgecumbe, was added to the north side of the school. A new coal furnace was purchased for $185 and the chimney was built in 1912. The first bond payment for $368 was made July 12, 1912 to F & M Bank. At that time, tuition paid to Benton Harbor City Schools for high school tuition cost $20 for two students each year. Records show school was closed for two weeks in 1913 because of smallpox, a very common disease at that time. The basement, which did not have an inside entrance, was excavated and two outhouses were fixed in 1914 for a total cost for materials and labor of $82.92, and a new well was dug for $150. In 1917-18, the school year was increased to 8 1/2 months. A floor was put in the primary room. Long-distance telephone calls to Eau Claire totaled 10¢ for the year. School board salaries rose to $20 for the Director $15 for the Treasurer, and $10 for the Moderator $10. Payment to the Michigan Teachers’ Retirement Fund in that year was 1/2 of 1% of the teacher’s salary, totaling $1.84 that was subtracted from the teacher’s salary of $368 for the year. Postage costs in 1919-20 totaled 20¢. That year has the first record of paying for light and power, with payments to Benton Harbor & St. Joseph Light Company averaging $2 to $3 per month. By 1922 tuition was up to $60 for each high school student. Since students went to whichever high school they chose, payments were made to several schools. The school year was finally extended to 9 months in 1924. The newspaper headline for March 31, 1927 proclaimed “Kings Landing School Burns.” One sentence from the newspaper stated “The lives of two teachers were endangered shortly before 9 o’clock this morning when fire destroyed River School on the new Kings Landing – Eau Claire Highway.” River School burned to the ground just as school was about to begin. Sixty students were saved from tragedy when Mrs. Florence Biastock went outside to check on students after the first bell rang at 8:30 A.M. She noticed smoke coming from the roof, ran inside and told Kenneth Merritt, the other teacher; together, they got the students out of the building. Neighbors helped remove the piano, two desks, and a motion picture machine. The teachers tried to put out the fire using two fire extinguishers but failed; they got out just as the roof fell in. Everything was totally destroyed. One hour after the fire began all that was left standing was the brick chimney and jagged walls. The school year was completed in Peterson’s Hall with payment of $ 150 for rent. The cause of the fire was unknown, but since it started in the roof, sparks or a defective flue are the likely causes. School records stated the building was insured for $5,500 with $500 on contents but newspaper accounts provide contradictory information about the amount of damage, the age of the building, and improvements that had been made. The day after the fire, April 1, they voted to order plans #9 and #10 from the state to build a two-room school. By May 2, they sent the revised plan to the state for approval and voted to buy additional ground from Mr. Smith (Smirinotis) seven rods east and one rod south for $250. May 23 a $9,000 bond to build was voted in, and on July 5 the contract to build was awarded to Schlutt Brothers., who had the lowest bid of five at $10,850. The high bid was $14,376. When school started in 1927 it was in a new school, with a new teacher, Rose Bittner. In 1929 George Pope replaced Mr. Merritt as teacher and Principal. By 1934 the millage for general purpose had been raised to 8.5 mills. A debt retirement millage was also approved during the 30’s and 40’s, usually around five to six mills. A special meeting was held in 1939 to decide if tuition should be paid for high school students, with the motion passing by a vote of ten to four. The governance of the school was conducted at annual meetings, which often varied in attendance. For example, the annual meeting in 1937 was called three times. The first was on July 12, when only three people, two of them board members, attended. Consequently, the meeting was postponed to July 19 hoping more people would come. When only four people attended, the meeting was again postponed to July 25, when the meeting proceeded with five people (three board members). The same situation occurred in 1945 and 1946 when only the board members attended the annual meetings, but by then, they simply proceeded with the meetings. At one of these annual meetings, no one had a school key so they held the meeting outdoors. In 1947, the board gave Miss Bittner a bonus of $300 as an incentive for her to stay at River School after she was offered more money to teach at Fairplain School. The incentive was successful! The decade ended with the last of the school bonds being paid to John Brennan. At a special meeting in 1953, a vote of six to zero authorized the purchase of one-half acre at the back of the property from James Smirinotis. The purchase, which represents the last land purchase by the school, was finalized on June 6 for $250. That year River School, along with several other elementary schools in the area, took a trip on the New York Central Railroad to Detroit to see Greenfield Village. The cost of the trip was $6,392.20, all of which was repaid to the school. Florine Brown came to River School in 1954 to teach beginners and first grade. Since the school still just had two rooms, she taught on the stage in the basement. On October 29, 1955, a special election was held to vote on a bond issue for a classroom addition. Only property owners could vote on the $20,000 bond issue, which passed 29 to 2. All registered voters could vote on the 8-mill debt retirement issue, which would run from 1956 to 1966: it passed 31 to 2. At that time there were 80 students with Mrs. Brown, teaching 19 of them. The 21’ x 32’ brick addition was built on the north end of the school and included a separate entrance, a classroom with lavatories upstairs, and a full basement with a large kitchen. Designed by Setterberg and McGrath, the $28,000 contract to build was awarded to Longacre Construction Company. 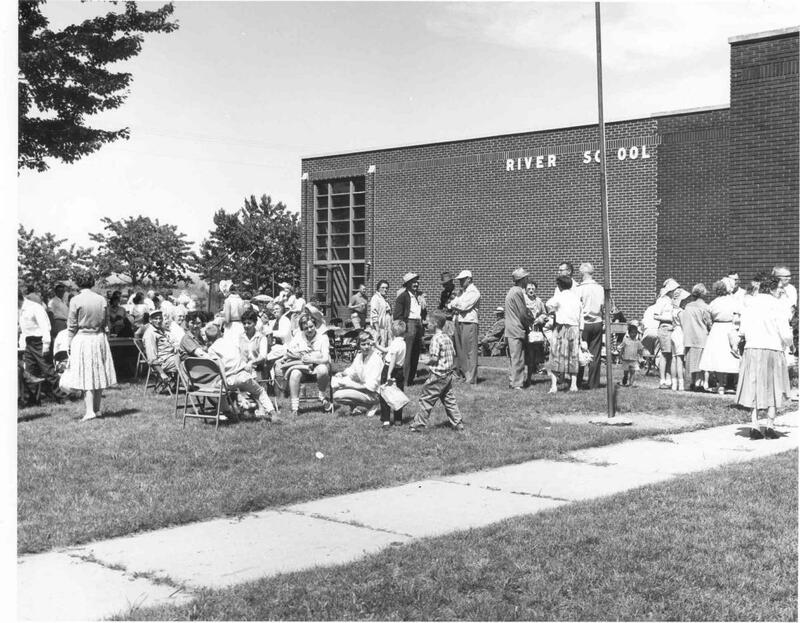 By 1956, River School had three rooms. 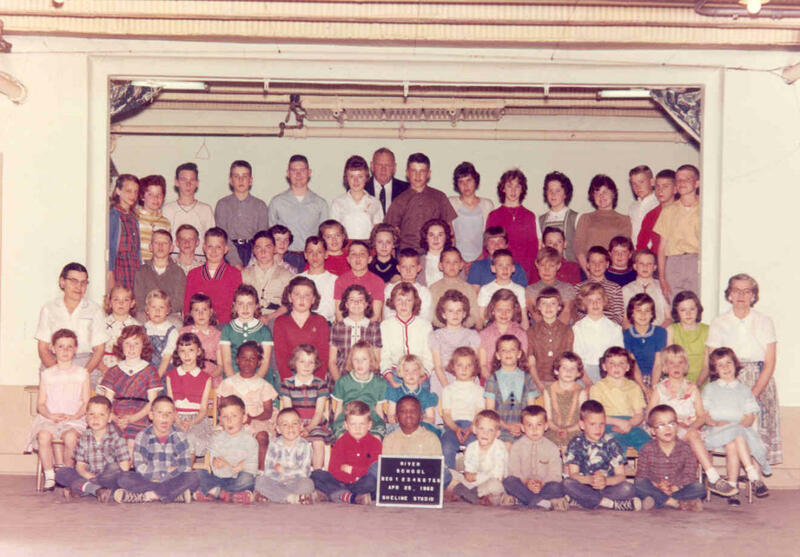 During the mid-60’s there was a significant movement for countywide school annexation. Several meetings were held with all the schools, many plans were proposed, and everyone had an opinion. After the countywide plan was voted down in May 16, 1966, most of the primary schools consolidated on their own. Riverside and River School were the only two primary schools in Berrien County voting to remain independent, with River School maintaining its independence by a margin of 57 to 13 out of 102 voters. 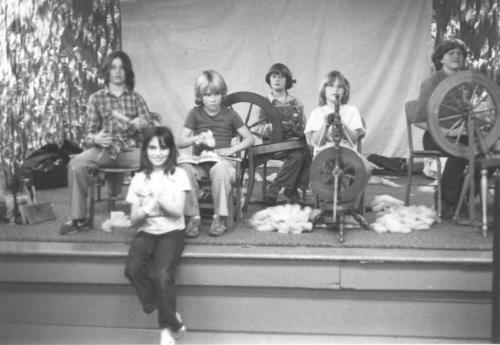 Even though extreme pressure to consolidate continued throughout the late 60’s and early 70’s, River School prevailed as an independent primary school. Until that time most graduates attended Benton Harbor High School; afterwards Eau Claire High School agreed to accept our students for tuition, a practice that continues today. After countywide graduation was discontinued in 1966 River School held its own ceremony, complete with decorations, Pomp and Circumstance, and a speaker. Graduates were also treated to dinner by the school board. In 1969, River School had its first school reunion. 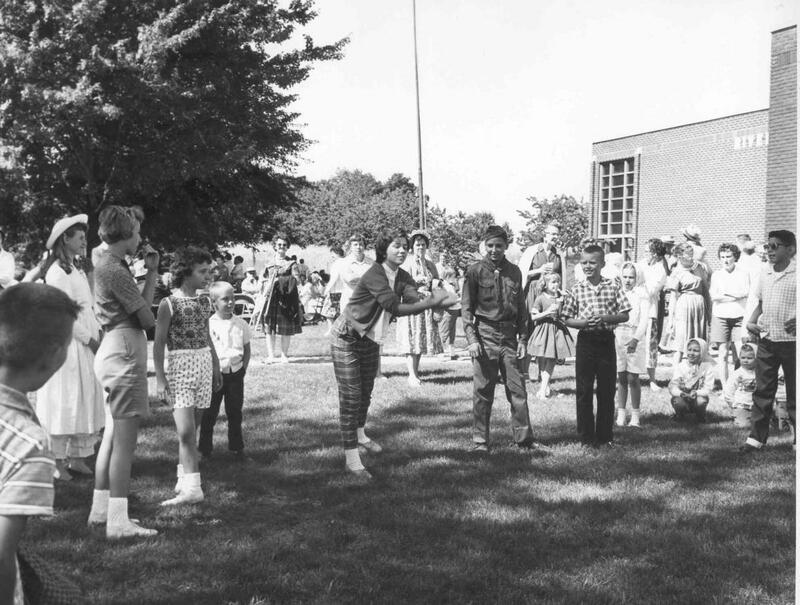 Chaired by Lawrence E. Harte, the July 5 event at the school gave former students, teachers and friends an opportunity to tour the school, hear its history, see old pictures, and join in a pot-luck supper. 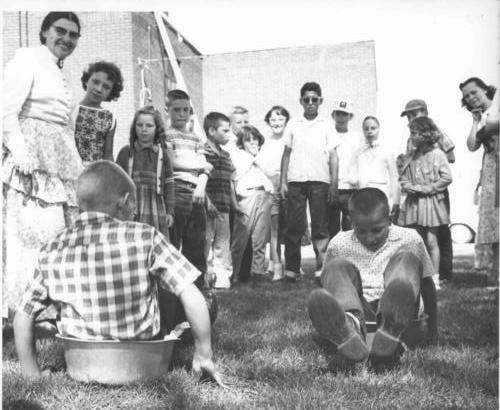 1969 also marked the last year River School had a school census. Previously, someone who lived in the district was paid every year to count all school age children. In 1992-93 the district had a State Equalized Valuation of property of $2,837,350. The operating millage was 26 mills and the budget totaled $231,100, which included high school tuition of $3,018.04 per pupil and transportation costs. There were 69 elementary students enrolled and 13 high school students. Staff included four classroom teachers, with one of them serving as Principal, a Chapter I teacher, and a teacher’s aid. Salaries were based on the degree earned and the number of years of experience. The school also employed a part-time music teacher, a part-time bilingual aid who also taught Spanish, and a janitor. School Board salaries were $350 for the President, $400 for the Secretary, and $450 for the Treasurer. Throughout its years, River School has been involved in many activities besides reading, writing, and arithmetic. There were potluck suppers, box socials, and cakewalks. Chicken suppers, spaghetti suppers, and just plain suppers. Hayrides, sleigh rides, and treasure hunts. Softball games, Ping-Pong games, roller-skating, and swimming at the “Y”. Blind turkey, pom pom pullaway, and snowball fights. The Fall Festival, Halloween (when you tried so hard not to talk so no one would guess who you were), and students making Thanksgiving Dinner with all the trimmings. The Christmas program with all its decorations and Santa, and Valentine’s Day (remember decorating your box and wondering if you would get that “special” one?). Students began each day with the Pledge of Allegiance and students formed the Safety Patrol, with attire that included a belt, an armband, and—if you were lucky—a badge. Parent/Teachers Association and Men’s Night, which involved men complete with aprons managing to cook up a feast in that little kitchen. And there were school trips. Mr. Pope takes credit as the first teacher in Berrien County to take students to the Capitol in Lansing, the state prison in Jackson, and on tours to Chicago, Detroit, and Indianapolis, among other places. School years always ended with graduation and the school picnic. River School really is a family. Many, many families have two and three generations of River School students. The Hafers have two branches with four generations each who went to River School. Ida Hafer Rauch, her son Leonard, grandson Ronald, and two great-grandsons, David and Brian, all attended as students. Ida’s younger brother Albert Hafer married Blundena Steinke, another student. Their son Arnold, granddaughter Connie and her son David, and grandson Keith and his daughter Kristina all were students at River School. As of the writing of this history in 1993, several former students of River School who are over 80 years of age four still live in the district. They are Raymond Ferguson, Alfred Rauch, Elsie Rhode, and Carl Steinke. Olga Villwock Shaffer, who lives in South Bend, is the oldest former student at 91 years of age. Two other students are Edna Herman Karsen, who is 89 years of age, and Vina Prillwitz Robbins, who is 86 years of age. In the late nineties a new gabled roof was installed over the original tar and gravel flat roof and air conditioning units were installed for the three upper floor classrooms. All of the windows and outside entrance doors were replaced also to improve heating efficiency. These improvements and septic system upgrades enable the building to be used for many more years into the future. In the summer of 2004 a wireless internet capability was put in place to allow the staff and students high-speed access to the internet. During the 2004-2005 school year the Parent Teacher Student Organization, under the leadership of Catherine Glassman, embarked upon a campaign to update the school’s playground equipment. Through auctions, spring flower sales, T-shirt sales, candy sales and the like, enough funds were raised to replace the equipment. Through a community work effort in August 2005 the new equipment was installed for the start of the 2005-2006 school year. River School began with one teacher. Mrs. Amos Thomas (Laura Shairi), who graduated from River School in 1895, remembered her first teacher was Low Rector. Fred Gleason is the first teacher on record in 1892. He taught a large number of students. In 1894 there were 56 students enrolled; however, the average daily attendance was 26 students. Mr. Gleason’s salary in 1901 was $320 for the year, and the teacher also served as the janitor. 1910 was the first year two teachers were hired. Katherine Ennis taught 49 students in the lower grades; her salary was $35 per month. The upper room teacher was Lula Hyde, who taught 31 students for a salary of $40 per month. By 1923 salaries had gotten larger. Lula Humphrey received $100 per month for teaching 36 students in the lower grades and Kenneth Merritt received $125 for teaching 32 students in the upper grades. It was normal for the upper room teacher to get more money; the teacher was usually a male who was also the Principal. In the late 20’s two teachers were hired who taught more than two generations of students at River School. Rose Bittner was hired in 1927 and George Pope in 1929. Many of the students who were taught by Miss Bittner and Mr. Pope had children, and in some families even grandchildren, who attended River School when they were still teaching. Mr. Pope taught his son, Gary, and his grandson, Graydon. We don’t have a record of their salaries at the time they were hired but by 1934 they were considerably lower than they had been ten years earlier due to the Depression. Mr. Pope received $80 per month and Miss Bittner received $70 per month. In that year Mrs. Beckwith was hired to teach music for $6 per month. She taught for several years, well into the mid-30’s, when she earned $12 per month. In 1942 both teachers still earned less than $100 per month but by 1946, after World War II was over, that had doubled. Mr. Pope also received a separate salary of around $30 per month as janitor. River School still had two teachers until 1954 when Florine Brown was hired. It was still a two-room school then, so Mrs. Brown taught her beginners and first-grade students on the stage in the basement. When the addition was being built in 1955-56 she had 19 students; there were 80 students enrolled in school that year. Mr. Pope taught at River School for 50 years, retiring in 1979. Miss Bittner taught for 37 years at River School, her entire teaching career, until she retired in 1965. 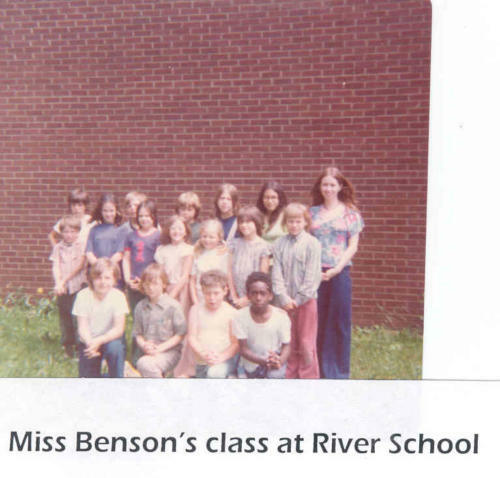 Mrs. Brown taught at River School for 14 years, retiring from full-time teaching in 1968. She then taught here as a substitute for two more years. Following is a list of teachers who have taught at River School that we know of at this time. John Wayne Allen, Judith Anderson, Sharon Ball, Darrel A. Beebe, Colleen Jill Benson, Mary Elizabeth Bentham, Georgia Biastock, Carla Birmele, Rose Bittner, Pamela Britt, Florine Brown, Marlene Bruno, Mary-Lou Burkett Smith, C. G. Chaney, Mable Closson, Nellie Culver, Mable Closson, Sandy Denzel, Clyde Dohm, H.D. Engles, Edward English, victor Ferguson, Theresa C. Fodor Margaret C. Frisch, Ralph Frisch, Fred Gleason, Mary Gleason, Dora Greve, Lura Griswald, Florence Hauser, Lisa H. Heimbigner, Lula Hyde, Harry Hogue, Marcia Jones, Mrs. H. B. Lathe, Ruth Leitz, Mary Elizabeth Meier, Kenneth Merritt, James Mitchell, Myrna Pelon, Patricia a. Peterson, William Peyton, Randy Pfahler, George Pope, Eloise Potratz, Lillian Puterbaugh, Beatrice Ruple, Catherine Rustin, Maude Shairi, Barbara Shephard, Michelle Stark, Nina Steele, Jean C. Stroud, Virginia Velez, Rebecca Valle, V.E. Wallace, Beulah Whalen, Wendy Zahrn, Andres Velez, Sandy Biastock, Heidi Main, Lacie Noe, Summer Chellman, Tyler Cook, Rachel Foster, Christi Eppard-Mangold, Janet Drews-Ordiway, Michelle Stark, Brittany Craig, Michelle Koneff, Ryan Van Dusen. River School is a primary school district and has three members on the Board of Education. They are the President (originally the Moderator), the Secretary (originally the Director), and the Treasurer. The members are nominated and elected at the Annual Meeting held each July with the offices being elected in rotation. The first board members we have record of are John Fields, Moderator, and T.C. Prillwitz, Director, in t902. Mrs. K.L. Steimle was the first woman known to serve on the board being elected Moderator in 1916. Mrs. Amos Thomas (Laura Shairi) served as Director in 1937, when her husband died and she was asked to finish serving his term. She was re-elected in 1938 and served another full term. Her father, John Shairi, also was a board member, elected Treasurer in 1910. Just as attending River School is a family tradition, so is serving on the school board. There are families who have had brothers or uncles and nephews on the board. Sometimes a husband and wife or father and child have served together. One family, the Steinkes, has had two brothers, a nephew and his daughter on the board as either Secretary or Treasurer. The Langes have also shared much experience on the board. John Lange served as President beginning in 1910 and then as Treasurer in 1920. His son, Arthur, was elected Treasurer in 1939. In 1964 Charles, his grandson, was elected President. Sally H. Lange, whose husband, Tom, is another grandson of John, served as Treasurer beginning in 1969 and later as President. Several board members have served ten or more years. Arnold A. Hafer served for 15 1/2 years and Sally H. Lange for 18 1/2 years. William Versaw served the longest on the board, about 23 years, but not consecutively. Following is a list of current and previous board members we know of at this time.